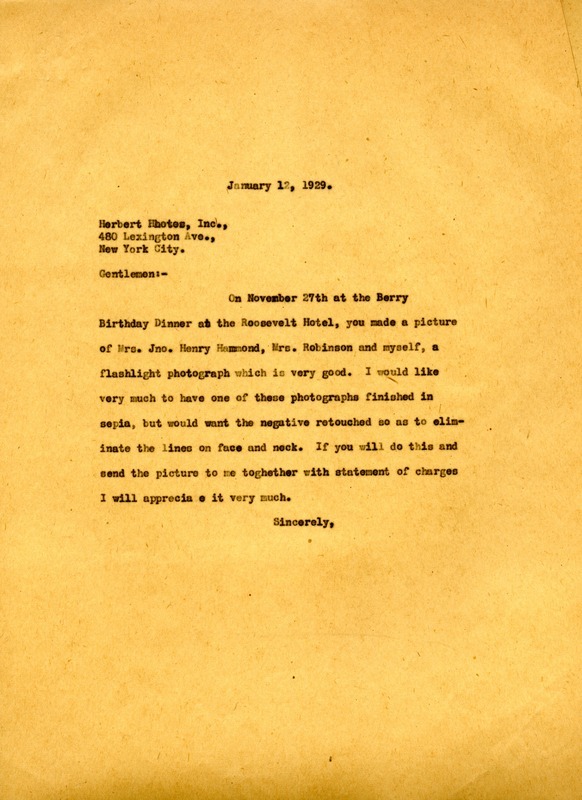 Berry seeks a copy of a photograph taken of her, Emily Vanderbilt Hammond, and Corinne Roosevelt Robinson at the Berry Birthday Dinner. She wishes to have the photograph retouched to eliminate neck and facial lines. Martha Berry, “Letter to Herbert Photos, Inc. from Martha Berry.” Martha Berry Digital Archive. Eds. Schlitz, Stephanie A., Sherre Harrington, et al. Mount Berry: Berry College, 2012. accessed April 20, 2019, https://mbda.berry.edu/items/show/10264.